It seems that there are "sanity checks" in place within the VR programming to prevent movement being misread. One of these checks is the presumed maximum speed that it's physically possible for someone to move their wrist, but it seems Beat Saber players have proved them wrong, prompting the update. Valve developer Ben Jackson stepped into the comments to clarify the situation. "The tracking system has internal sanity checks to identify when things go wrong." stated Jackson. "For example, if our math says you are *behind* your only basestation, clearly we made a mistake, because we wouldn't be getting any signal from behind the basestation. One of these checks relates to how fast we thought it was physically possible for someone to turn their wrist. It turns out that a properly motivated human using a light enough controller could go faster (3600 degrees/sec!) than we thought." 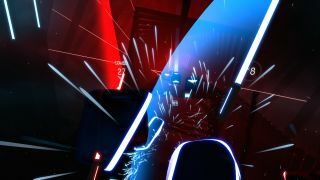 If you're unfamiliar with Beat Saber, imagine Guitar Hero with lightsabers and you won't be far off the mark. The VR rhythm game entered Early Access last May and has earned Overwhelmingly Positive reviews on Steam since then. If you're curious as to how the game looks and plays, it's well worth checking out this perfect run of a custom Beat Saber track.